The Joseph Smith Building (JSB) that currently resides on the south end of BYU campus is not the first building to be named after the first prophet of the LDS church. The Joseph Smith Building that preceded it was built in 1941 and served as a center for campus life before it was removed in 1990. The Joseph Smith Memorial Building marked an uneventful but significant change for Brigham Young University. In the fall of 1938, the BYU Board of Trustees (including the daughter of Brigham Young, Susie Y. Gates) was released and thanked by the church for their service. Up to that time, the Board of Trustees was comprised of individuals close to general authorities and those in the stake presidencies of the surrounding area. In 1938, the First Presidency and the Quorum of the Twelve Apostles of the Church of Jesus Christ of Latter-Day Saints became the Board of Trustees. Heber J. Grant, president of the church, placed first priority on establishing the religious character of the school before building more academic buildings. The Joseph Smith Memorial Building was the first step toward that goal. Like some other LDS buildings around the world, the Joseph Smith Memorial Building was constructed by the generous labor of locals. The General Welfare project the building became was the largest the church had attempted up to that time. 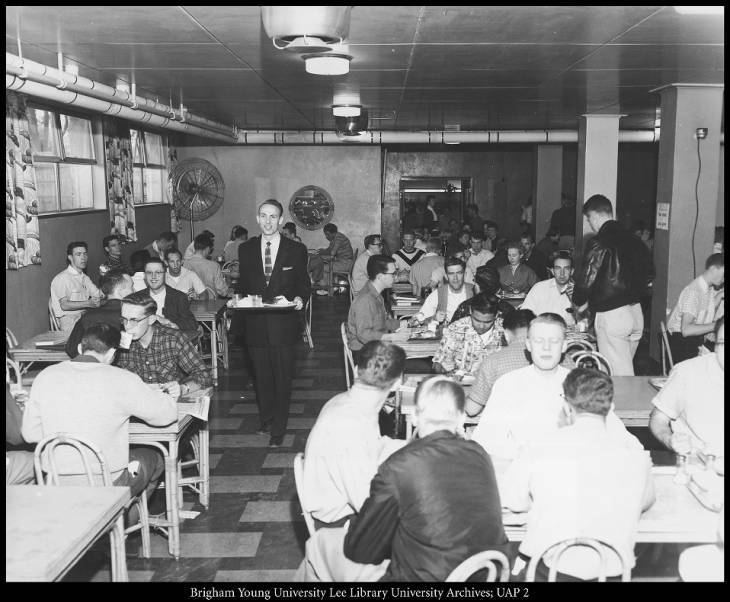 Beginning in July 1939, Harold B. Lee, Director of General Welfare, coordinated the effort of twelve stakes and numerous BYU students, who all donated their time and efforts. 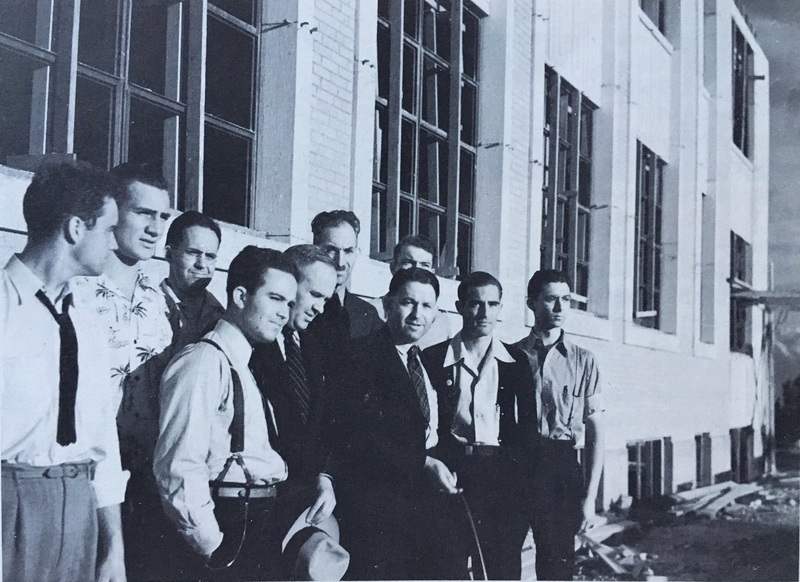 Each man was asked to donate one day of work on the building, and students were granted a day off of classes for their service. Foreman Burt Russell handled the laborers and ensured the quality of the building. On Founder’s Day October 16, 1941, the building was completed and dedicated. The new auditorium was large enough to fit the students with a total of two thousand five hundred seats. The dedication was the first time in twenty years that the whole school was able to meet in one auditorium. The auditorium also had a new state-of-the-art speaker system, which had a glitch during the dedication ceremonies. Karl A. Miller later wrote, “During the dedication, at the conclusion of the opening prayer when the amen had scarcely been uttered a cut-in from the local radio station announced loud and clear, ‘Two eggs were required and . . .’ Norman Geertsen’s hands flew and all the stops were pulled. The remainder of the recipe was never completed as far as the startled assembly was concerned.” The dedication continued uninterrupted, and President Grant offered the dedicatory prayer. The Joseph Smith Memorial Building served a similar function that the Wilkson Center does now. The building included an auditorium, faculty offices, classrooms, a small library, a cafeteria, a ballroom, and a banquet hall. While the building’s main purpose was being the religious center of the university, it was also a center for many aspects of BYU campus life for many years. 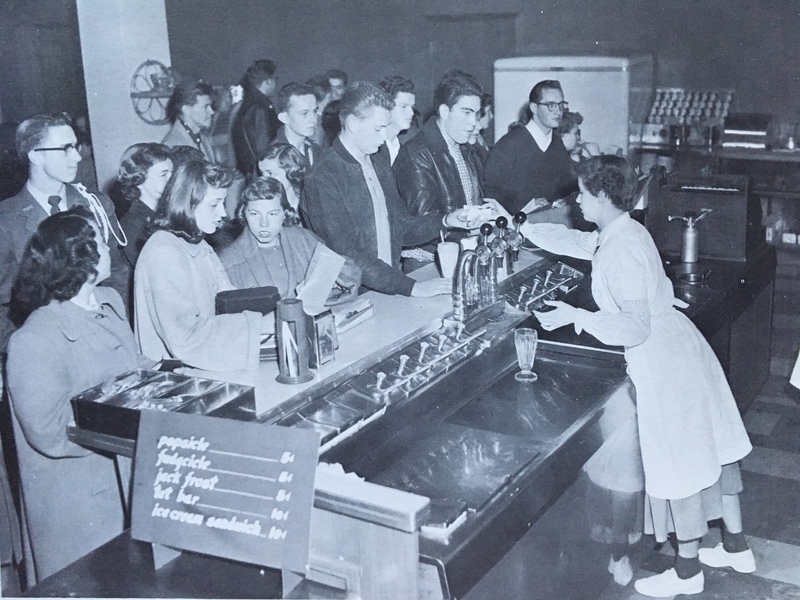 The cafeteria in the basement became known as the Commons and included an area known as the Cougareat. The auditorium served as a performance center for plays and musical numbers before the Harris Fine Arts Center was built. 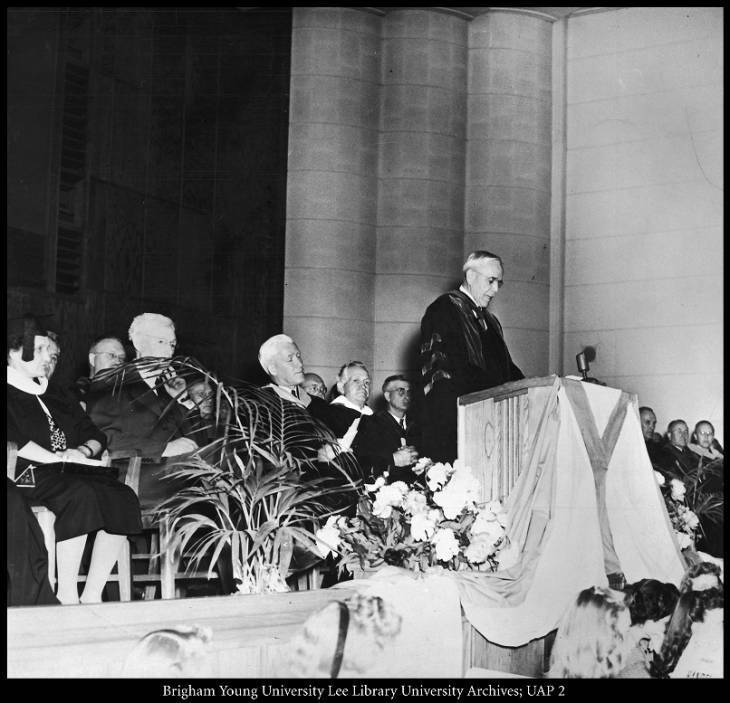 BYU’s graduation ceremonies were held in the Provo Tabernacle from 1909 to 1941 but were held in the Joseph Smith Memorial Building after it was built. Education Week was also centered in the new building rather than its previous location in the Education Building. The multiple relocations included more than events. In 1949, the organ in the Salt Lake Tabernacle was being replaced. The old organ was removed and shipped to BYU to be put in the Joseph Smith Memorial Building chapel. As more BYU buildings were built, the many functions that the Joseph Smith Memorial Building served were moved to other locations. In the late 1980s, BYU once again needed to accommodate the continual growth of the student body. More classrooms were needed, and the building was not up to code for earthquakes. The cost of a new building was lower than repairing the old one, so the original Joseph Smith Memorial Building was removed and the modern JSB was built in its place. Joseph Smith Memorial Building, 1939 ~ Source: From the L. Tom Perry Special Collections. “Joseph Smith Memorial Building, 1939,” available at https://contentdm.lib.byu.edu/digital/collection/BYUPhotos/id/410/rec/2. Groundbreaking ceremonies for the Joseph Smith Memorial Building, October 16, 1939: The groundbreaking for the Joseph Smith Building was the first to use a bulldozer instead of horses. ~ Source: From the L. Tom Perry Special Collections. 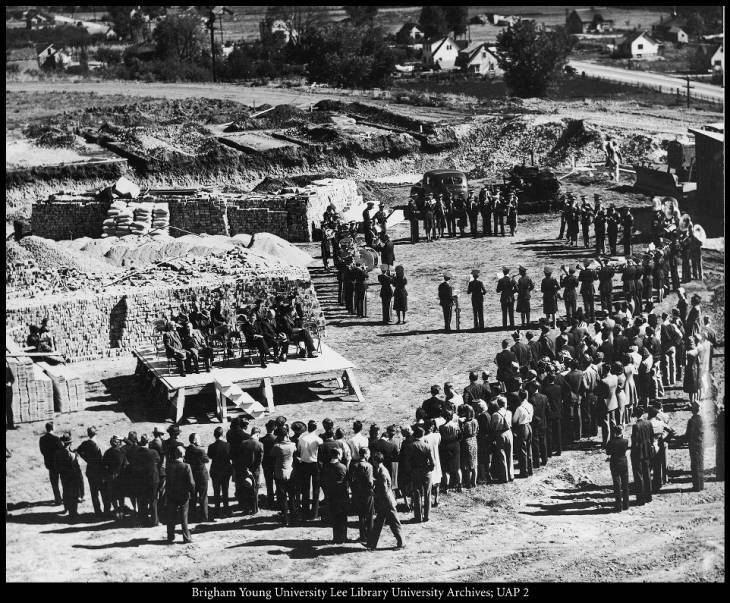 “Groundbreaking ceremonies for the Joseph Smith Memorial Building, October 16, 1939,” available at https://contentdm.lib.byu.edu/digital/collection/BYUPhotos/id/406/rec/9. Upper campus, ca. 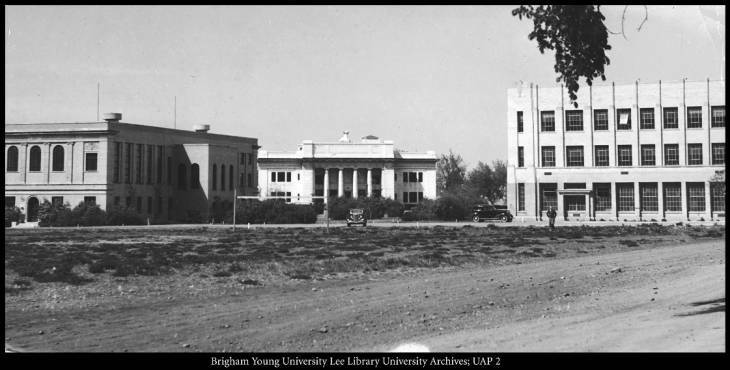 1938: The Brimhall Building is on the right, the Maeser Building in the middle, and the Joseph Smith Building on the left. ~ Source: From the L. Tom Perry Special Collections. “Upper campus, ca. 1938,” available at https://contentdm.lib.byu.edu/digital/collection/BYUPhotos/id/408/rec/9. Cafeteria in the basement of the Joseph Smith Memorial Building ~ Source: From the L. Tom Perry Special Collections. “Cafeteria in the basement of the Joseph Smith Memorial Building,” available at https://contentdm.lib.byu.edu/digital/collection/BYUPhotos/id/414/rec/10. Registration in the Joseph Smith Memorial Building, 1940s ~ Source: From the L. Tom Special Collections. 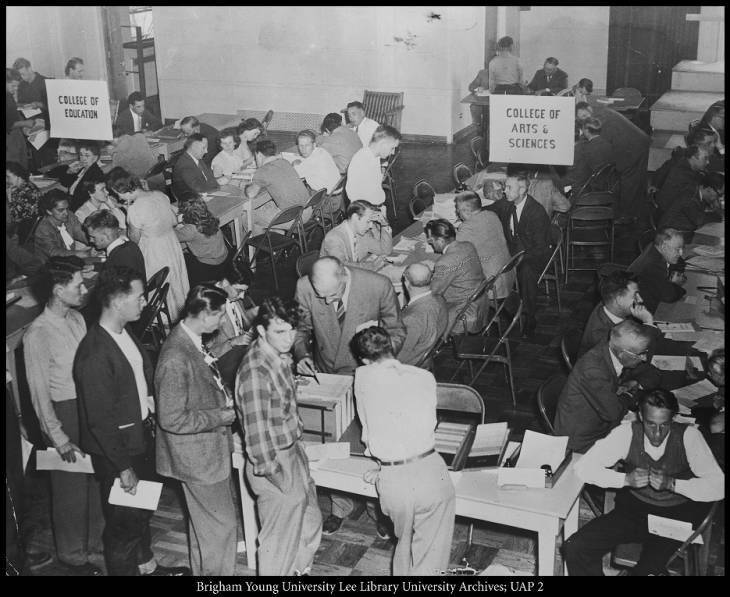 “Registration in the Joseph Smith Memorial Building, 1940s,” available at https://contentdm.lib.byu.edu/digital/collection/BYUPhotos/id/411/rec/10. Choir and orchestra practice on stage in the Joseph Smith Memorial Building, 1940s ~ Source: From the L. Tom Perry Special Collections. “Choir and orchestra practice on stage in the Joseph Smith Memorial Building, 1940s,” available at https://contentdm.lib.byu.edu/digital/collection/BYUPhotos/id/412/rec/5. 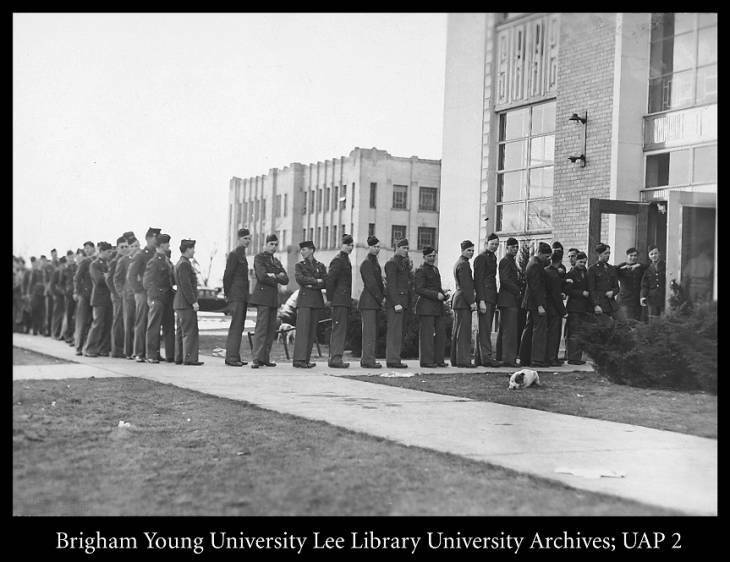 Soldiers at Chow Line Outside JSB Cafeteria: Soldiers in the Army Specialized Training Program on BYU campus during World War II formed chow line outside the Joseph Smith Building cafeteria. ~ Source: From the L. Tom Perry Special Collections. “Soldiers at Chow Line Outside JSB Cafeteria,” available at https://contentdm.lib.byu.edu/digital/collection/BYUPhotos/id/489/rec/3. Commencement processional to the Joseph Smith Memorial Building, 1947 ~ Source: From the L. Tom Perry Special Collections. 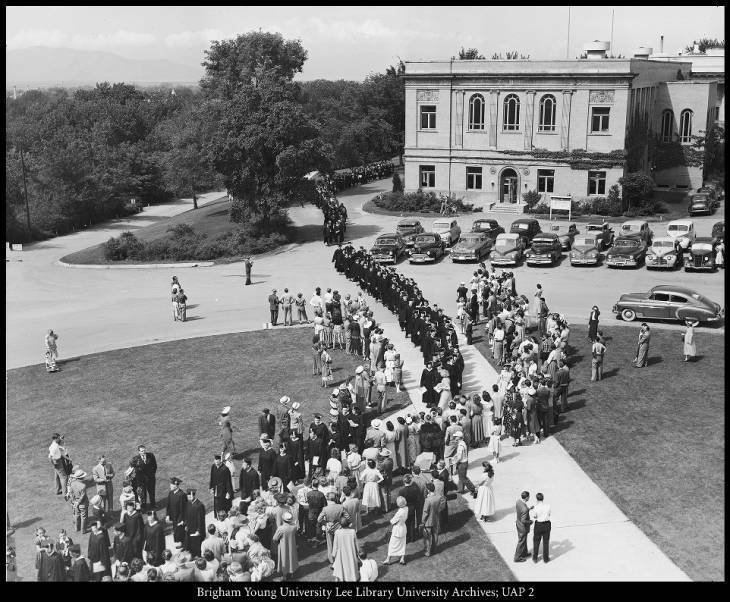 “Commencement processional to the Joseph Smith Memorial Building, 1947,” available at https://contentdm.lib.byu.edu/digital/collection/BYUPhotos/id/413/rec/8. Elder Joseph F. Merrill speaks at commencement exercises during the McDonald administration, ca. 1947 ~ Source: From the L. Tom Perry Special Collections. “Elder Joseph F. Merrill speaks at commencement exercises during the McDonald administration, ca. 1947,” available at https://contentdm.lib.byu.edu/digital/collection/BYUPhotos/id/500/rec/1. Seventy-fifth anniversary convocation in the Joseph Smith Building auditorium, October 16, 1950: At the seventy-fifth anniversary convocation in the Joseph Smith Building auditorium on October 16, 1950, President J. Reuben Clark, Jr. (at the pulpit), introduced Dr. Ernest L. Wilkinson as the new president of Brigham Young University. Church President George Albert Smith is at right, and at far left are Elders Richard L. Evans and Henry D. Moyle. The Diamond Jubilee lasted two days. 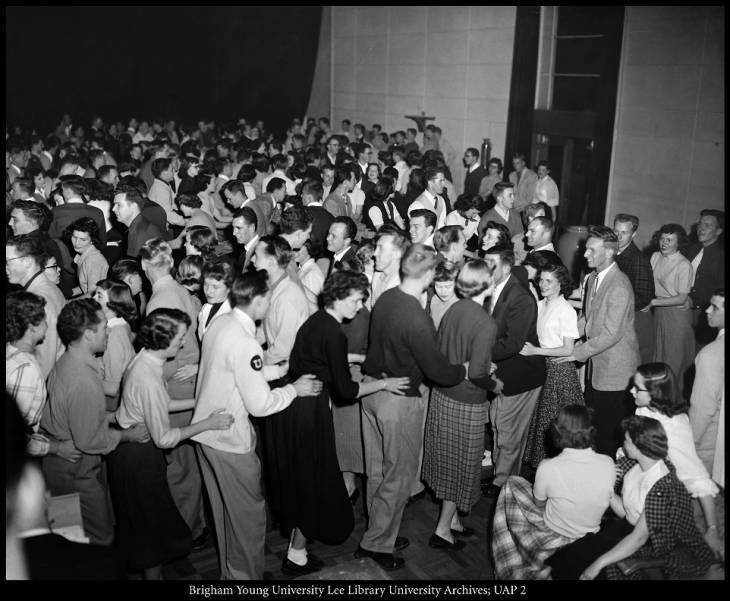 On the following day, October 17, 1950, the Carl F. Eyring Science Center was named and dedicated. ~ Source: From the L. Tom Perry Special Collections. “Seventy-fifth anniversary convocation in the Joseph Smith Building auditorium, October 16, 1950,” available at https://contentdm.lib.byu.edu/digital/collection/BYUPhotos/id/569/rec/2. Students in the College of Nursing participate in a program and reception, 1950s: The nursing program at BYU at first was entirely a four-year course leading to the baccalaureate degree. 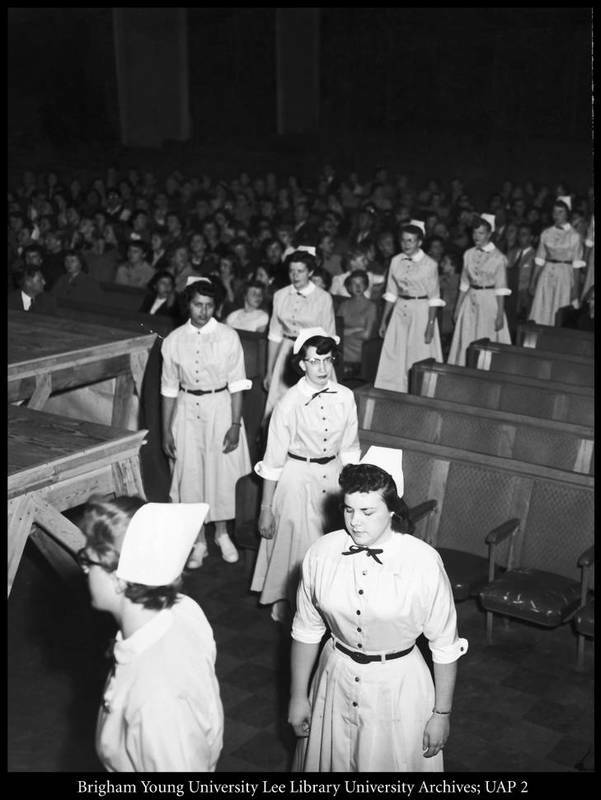 After their first year on campus, when the student nurses were to leave for study in the LDS Hospital and Primary Children's Hospital in Salt Lake City, a program and reception for them was held in the Joseph Smith Building auditorium (accompanying photograph). ~ Source: From the L. Tom Perry Special Collections. “Students in the College of Nursing participate in a program and reception, 1950s,” available at https://contentdm.lib.byu.edu/digital/collection/BYUPhotos/id/583/rec/4. Production of "New Moon" in the Joseph Smith Memorial Building Auditorium, November 1952 ~ Source: From the L. Tom Perry Special Collections. 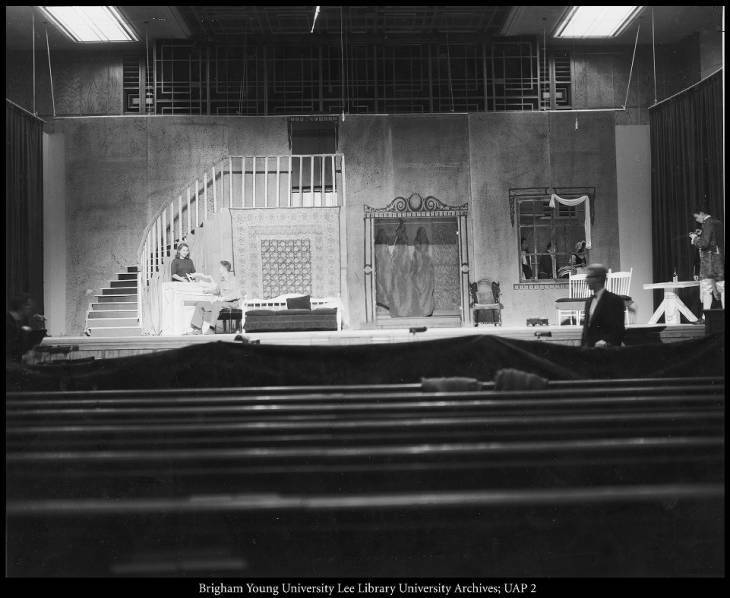 “Production of "New Moon" in the Joseph Smith Memorial Building Auditorium, November 1952,” available at https://contentdm.lib.byu.edu/digital/collection/BYUPhotos/id/415/rec/11. BYU Women's luncheon in the Joseph Smith Building ballroom, ca. 1960: President George H. Brimhall suggested the establishment of a BYU Women's group in 1914 and appointed Mrs. Elbert H. Eastmond to organize it. BYU Women have operated with vigor since that time to build sociability, culture, and University support among the BYU women employees and wives of faculty and staff members. 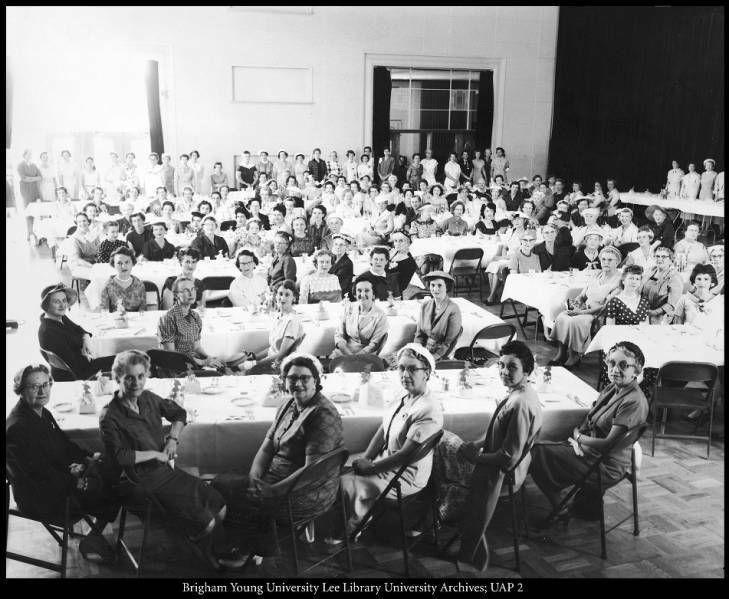 This photograph was taken in about 1960 at a BYU Women's luncheon meeting in the Joseph Smtih Building ballroom. ~ Source: From the L. Tom Perry Special Collections. “BYU Women's luncheon in the Joseph Smith Building ballroom, ca. 1960,” available at https://contentdm.lib.byu.edu/digital/collection/BYUPhotos/id/592/rec/5. 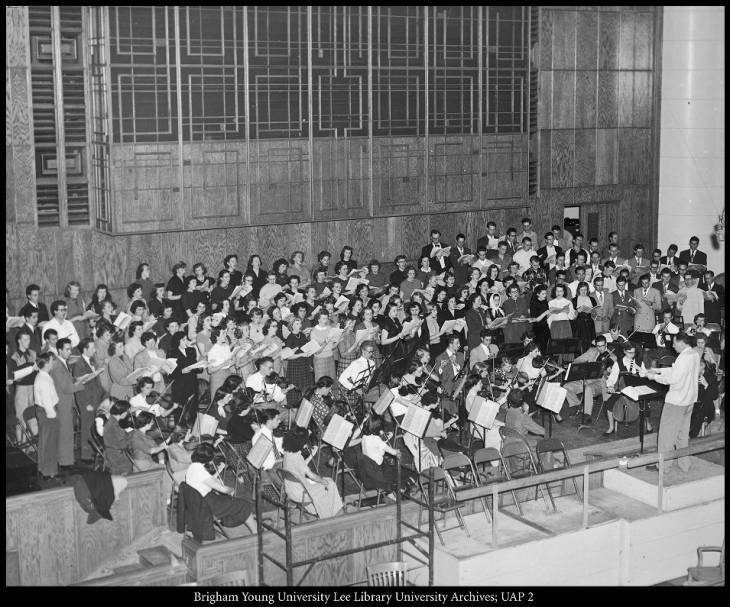 The BYU combined choruses and orchestra practice in the Joseph Smith Memorial Building, 1963 ~ Source: From the L. Tom Perry Special Collections. “The BYU combined choruses and orchestra practice in the Joseph Smith Memorial Building, 1963,” available at https://contentdm.lib.byu.edu/digital/collection/BYUPhotos/id/805/rec/6. Cougareat: Set up in one corner of the Smith Cafeteria was the "Courareat" (a play on words from "Cougarette"), a counter for quick snacks. ~ Source: Butterworth Jr., Edwin. Brigham Young University: 1,000 Views of 100 Years. Provo, UT: Brigham Young University Press, 1975. 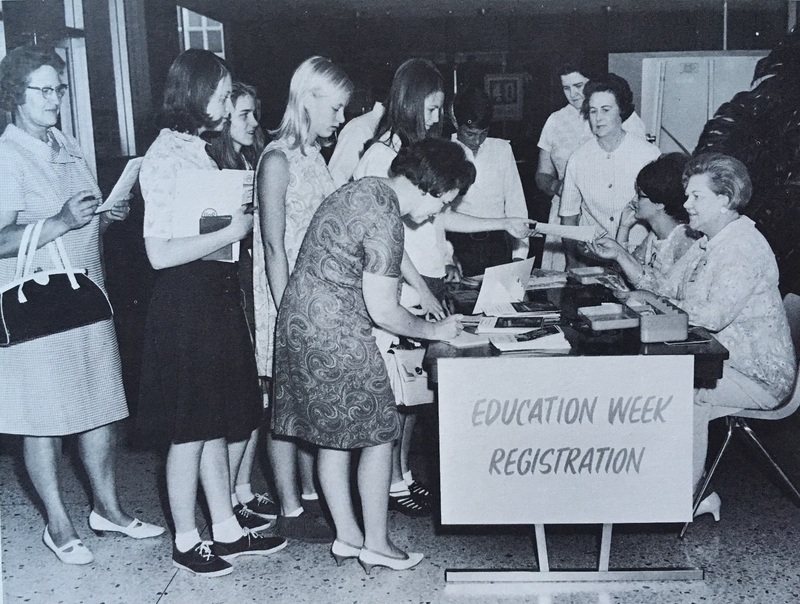 Education Week Registration ~ Source: Butterworth Jr., Edwin. Brigham Young University: 1,000 Views of 100 Years. Provo, UT: Brigham Young University Press, 1975. Inspecting Work on the Joseph Smith Building: Inspecting the work in the accompanying photograph were committeemen and students: Ernest Manwaring, left; John Weenig, BIll Reeve, Twain Tippetts, Dean Harld R. Clark, Director Wyley Sessions, Architect Fred Markham, unidentified, and Lavar Bateman. ~ Source: Butterworth Jr., Edwin. Brigham Young University: 1,000 Views of 100 Years. Provo, UT: Brigham Young University Press, 1975. New Building Nearing Completion ~ Source: From the Provo Daily Herald. 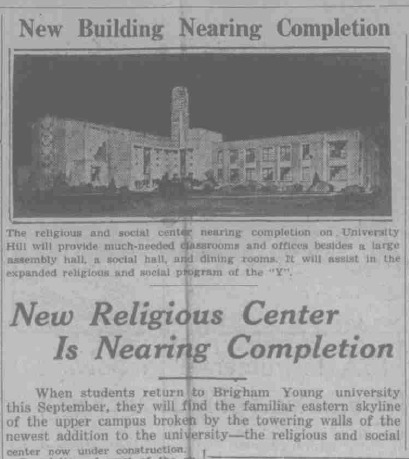 “New Religious Center is Nearing Completion,” September 12, 1940. Available at https://newspapers.lib.utah.edu/details?id=22717980&q. 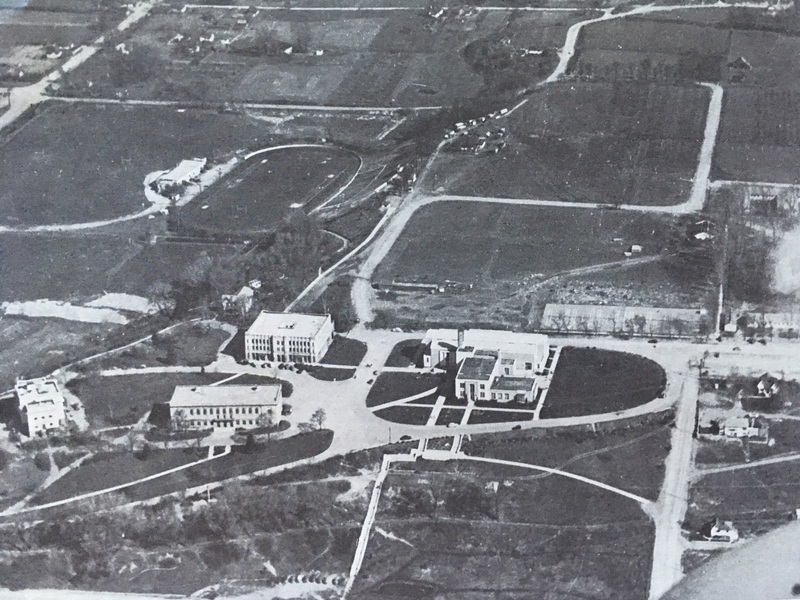 Upper Campus 1945: This was Brigham Young University Upper Campus when President Howard S. McDonald assumed office in 1945. There were the Maeser, Grant, Brimhall, and Smith Buildings, with the stadium and Stadium House beyond. The Carl F. Eyring Physical Science Center was built at the location of the tennis courts on the right side of this photograph. Some of the temporary war surplus buildings are visible. ~ Source: From the Provo Daily Herald. “New Religious Center is Nearing Completion,” September 12, 1940. Available at https://newspapers.lib.utah.edu/details?id=22717980&q. Emily Cook, Brigham Young University, “Joseph Smith Memorial Building,” Intermountain Histories, accessed April 19, 2019, https://www.intermountainhistories.org/items/show/228. Butterworth Jr., Edwin. Brigham Young University: 1,000 Views of 100 Years. Provo, UT: Brigham Young University Press, 1975. Cowan, Richard O., from the Religious Studies Center. “The Original Joseph Smith Building,” available at https://rsc.byu.edu/review/historians-corner-original-joseph-smith-building. Hatch, Ephraim and Karl Miller. 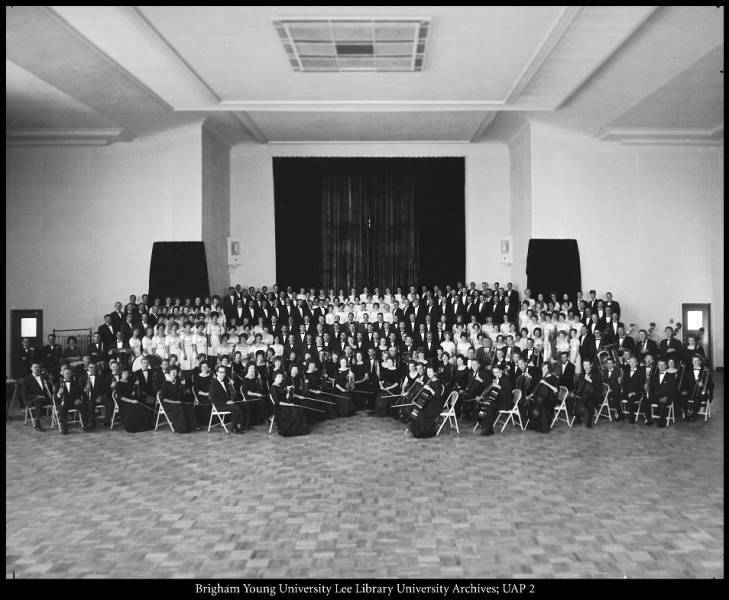 Brigham Young University: A History of the Campus and the Department of Physical Plant 1875 to 1975. Provo, UT: Brigham Young University Physical Facilities Division, 2001. Miller, Karl A. 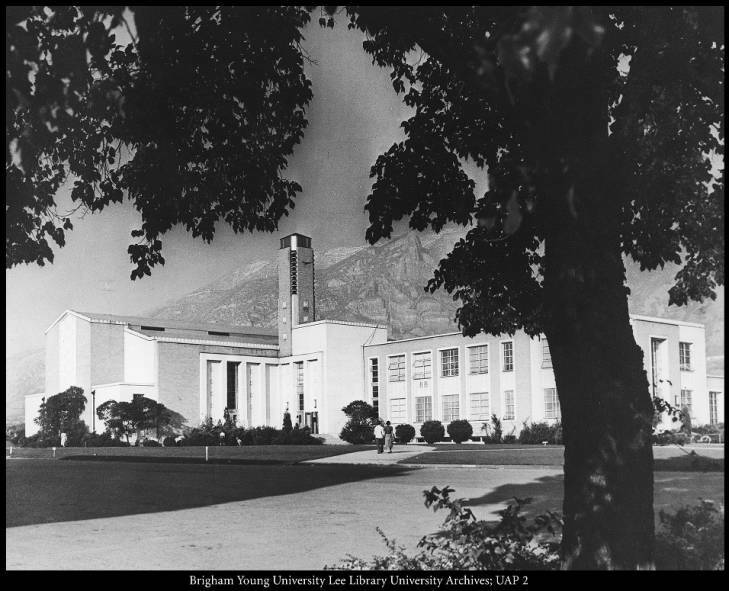 History of Buildings and Grounds: Brigham Young University. Provo, UT: 1989. From the Provo Daily Herald. “New Religious Center is Nearing Completion,” September 12, 1940. Available at https://newspapers.lib.utah.edu/details?id=22717980&q. From the Provo Daily Herald. “Concert Delights Provo Audience,” February 3, 1942. Available at https://newspapers.lib.utah.edu/details?id=22721979&q=%22joseph+smith+building%22+religious+center+byu&year_start=1938&year_end=2016. From the Provo Sunday Herald. “130 Students to be Initiated at University Rites,” March 4, 1945. Available at https://newspapers.lib.utah.edu/details?id=22707228&q=%22joseph+smith+building%22+religious+center+byu&year_start=1938&year_end=2016. 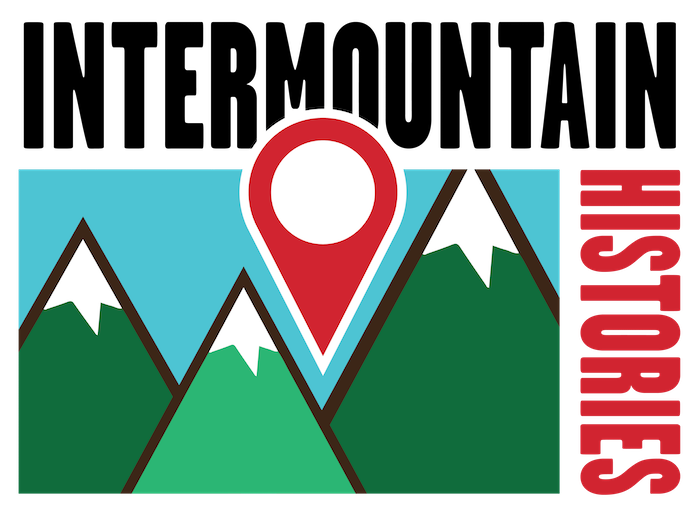 Telegram Leased Wire, The Salt Lake Telegram. 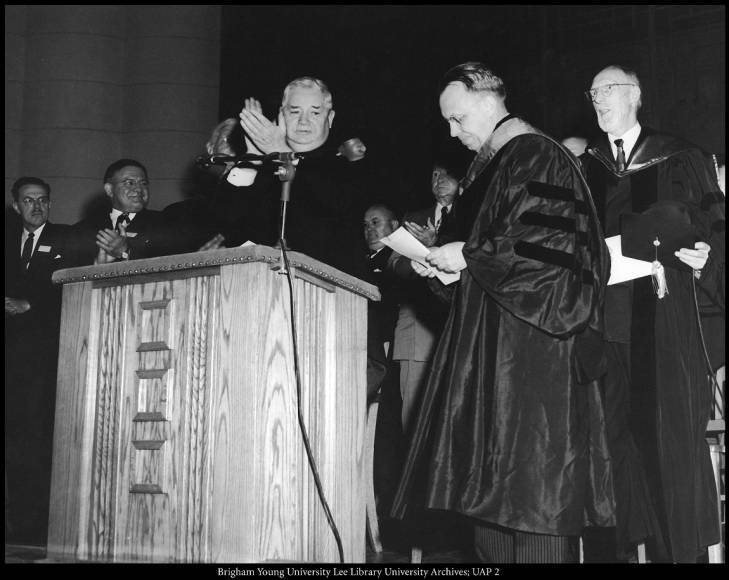 “Glorious Future Lies Ahead, Harold B. Lee Asserts at BYU,” June 2, 1941. Avaialble at https://newspapers.lib.utah.edu/details?id=16917555&q=%22joseph+smith+building%22+religious+center+byu&year_start=1938&year_end=2016.